Quantity: 20PCS(1 BOX). Length :9MM. Buy more and save more. It must be without SIGNED. Zone D: Belgium, United Kingdom, Denmark, Finland, Greece, Ireland, Luxembourg, Malta, Norway, Switzerland, Germany, Sweden, France, Netherlands, Austria, Spain, Switzerland. It is a good gift for your lover,family,friend and coworkers. hope you could understand. Weight: app5g. Countries 20% 30% 25% 15% 10%. Main Colour: Silver. It is a good gift for your lover,family,friend and coworkers. Weight: app5g. 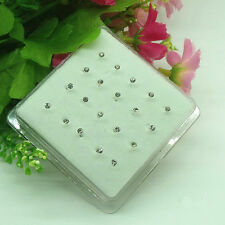 Quantity: 20PCS(1 BOX). Buy more and save more. It must be without SIGNED. Zone B: Australia, New Zealand. • Gauge : 20g (0.8mm). 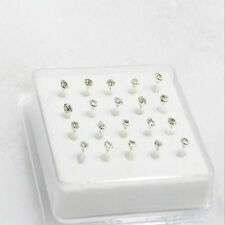 14K Solid White Gold Diamond Round Cut Nose Stud Ring. • Stamp: 14K. • Stone Shape: Round Brilliant Cut. • Stone: Diamond.